Swansea manager Michael Laudrup says finishing eighth in the Premier League would be like "winning the league". The Swans are eighth after their 1-0 win over Newcastle, a result that took them past Laudrup's pre-season target of 40 points, with 10 games remaining. The Dane believes the top seven places will be sewn up by more established clubs, but that eighth is achievable. "Eighth would be incredible, for me it would be like winning the league. It would be fantastic," he said. Is 40 points relegation proof? "I think the first seven spots are already there, Manchester [United], Manchester [City], Chelsea, Tottenham, Arsenal, Liverpool and Everton. "Coming eighth [will be] like winning the league because the other seven are above us." Swansea moved onto 40 points after Luke Moore's first Premier League goal of the season gave them a 1-0 win on Saturday. The goal came in the 85th minute after the Magpies had looked the stronger team for much of the second half. It capped a week in which the Swans won the League Cup and had been given an open-top bus tour and civic reception to mark their success. 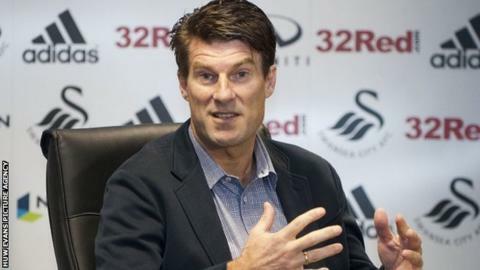 Laudrup believes that the Swans' points total has already ensured they will be playing Premier League football for a third season but he admits to being surprised at the speed at which his team have achieved their target. "I think we can say that [Swansea are safe]. I know if you look at the point the bottom three with 24 [points] they could still arrive, but I think 40 points we're there. "What is more important for me is we arrived at 40 points with 10 games to go. "I think I said the whole season our mark is 40 points and then let's see when we arrive [with] three, five or seven [games remaining]. "I never thought it was going to be [with] 10 games before the end of the season."